4 Where Do I Put The Promo Code for William Hill? 5 What Made Me Join William Hill? 12.1 Is there currently a promo code? 12.2 Can I claim this promotion code? 12.3 Can I claim more than one offer? 12.4 It’s not working, what do I do? Click “Show Code” above and claim the offer. Click “Join Now” which appears in green in the lower middle region of the William Hill page. Fill in your details on the form that appears and enter C30 into the promo code box. Be sure to check out other promo codes for William Hill casino, bingo or poker as well! Where Do I Put The Promo Code for William Hill? The promo code is put in when registering for an account. It’s on the very last step before you confirm your details and create the account. 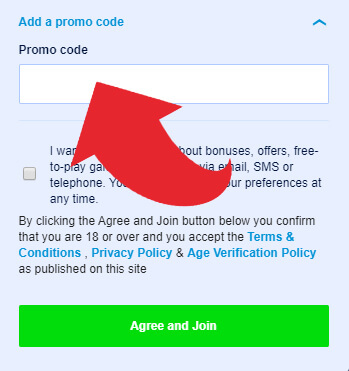 Be sure to click the down arrow on the ‘Add a promo code’ text and the form will appear to enter your code. If you input a valid code it will turn green you will know that it’s worked. If it goes red then something is wrong and you should either look at your spelling or the code may no longer be valid. 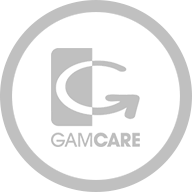 We check our codes every week to make sure they work but in the instance that a code doesn’t work, be sure to contact us and let us know. What Made Me Join William Hill? Williams Hill is one of the leading UK bookmakers, both online and off. 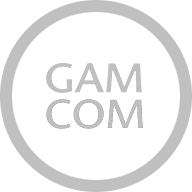 They have a great reputation amongst the online gambling community, so it’s only natural we wanted to try them out. William Hill has become one of my favourite online bookies.  I am particularly keen on their minimalistic site – it gives all the information you need without succumbing to the clutter of banner ads and super bright images that distract from the most important thing: the odds. They offer all manner of bets, from the usual football and horse racing to lotteries and virtual racing. They really have so many options that you can literally bet on whatever you want. I have yet to not be able to find a bet that I’ve wanted to play. I will say that if you aren’t actually sure about what you want to bet on it can be daunting trawling through all your various options. I would advise you to take your time and only bet if you find something you feel is really worth betting on! Having said that, I do like how on the right hand side of their site they have the top bets. 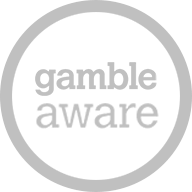 If you fancy a quick bet but don’t have the time to trawl through and find something that suits you, you can easily pick one of the more popular ones. Pros: It’s one of the oldest, most established bookmakers available today (they have in excess of 15000 staff! ), they have their own card for instant withdrawals, live sports on William Hill TV and their dedicated radio station, huge selection of sports but also has great casino and gaming. Cons: Small bugs in the app, in-play betting odds change is sometimes slow. William Hill TV is their live streaming platform which shows a large range of sports fixture. In-play betting is available on all the fixtures they show, as well as a lot of the ones they don’t. You can find in-play bets on the events they’re streaming by turning the “Streaming Events Only” button on. To be able to use WHTV you need to either have a positive account balance or have placed a bet in the past 24 hours. There are some rules to be mindful of when in-play betting. There can be a delay in a bet being accepted, particularly if the odds have changed. If the odds have changed after the bet has been placed but before it’s accepted, the new odds are used. Sometimes in-play betting gets suspended due to significant events. As always with live sports and in-play betting, having a good internet connection is vital as any lags or interruptions can really affect your experience. William Hill has many different apps, each catering to a specific punter. The William Hill Sports Betting app is available to download on both Android and iOS. The app is easy enough to use once you get used to the layout of it. There are some bugs that I have experienced, including freezing and sometimes being unable to log in. Others have experienced similar issues but they seem to resolve themselves over time. The app is updated every month or so which is good and means peoples issues are addressed pretty quickly. 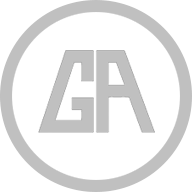 Overall the consensus is that the app is great, it has great reviews from thousands of players so they are obviously doing something right! You can also use the William Hill promo code within the app to get the £30 free bet, so make sure to do that. You can deposit and withdraw using all the usual payment methods, including Visa, MasterCard, Skrill and PayPal. The deposit and withdrawal limits vary depending on what method you use, with minimum deposits and withdrawals starting at £5. The time it takes for your cash to reach you after withdrawing also depends on what method you use, so bare that in mind when deciding how to withdraw. 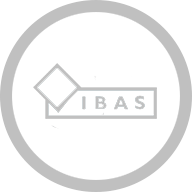 For more information on everything to do with deposits and withdrawals, head here. William Hill offers loads of promotions for existing customers. They rotate the promotions frequently so it’s best to check them for yourself here. Some of their current promotions include Enhanced Odds, which are available on all sports and Bet Boost offers. There are also a bunch of sign up offers for new customers which you can see on the table at the top of this page. Usually there’s one sign up offer per William Hill brand, e.g. Sports, Vegas, Casino, Bingo. We constantly check our codes to ensure that they work, and sometimes we’ll even offer an exclusive code just for BetCode users, which often leads to a bigger bonus. 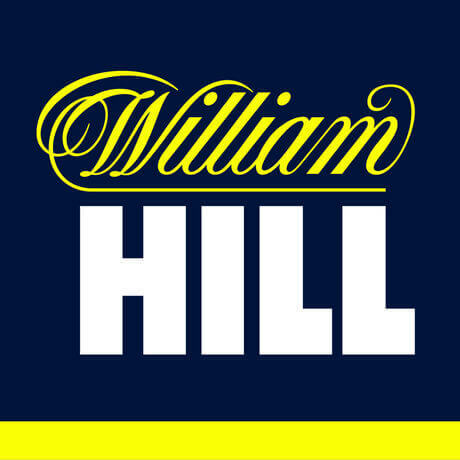 William Hill are one of the most popular brands in the UK market and their sites, apps and offers are generally very good. Make sure to find the right WH bonus that suits you before you sign up as you usually only get one chance to get the new customer offer. Yes, the code is C30. Can I claim this promotion code? Yes as long as you are a new customer, over 18 and meet all the terms and conditions. Can I claim more than one offer? With William Hill you get one opportunity to claim a new customer offer, so you must decide which one you’d like to claim when you register. After you’ve inputted the promo code and registered, you can’t then decide to claim a different bonus. 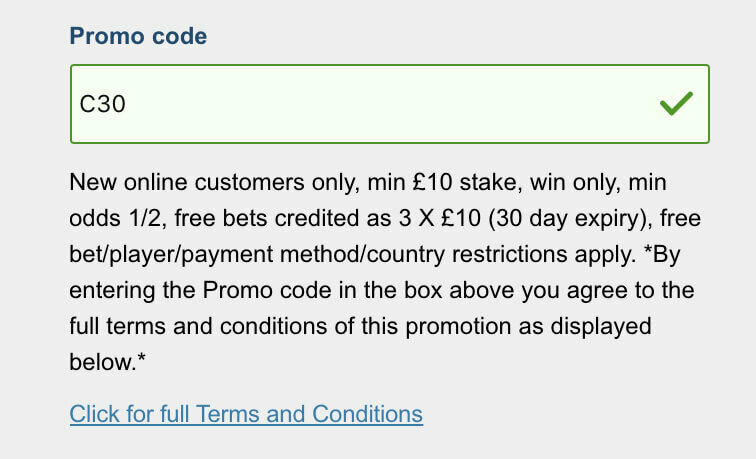 An example of this would be if you used the C30 code and then decided you wanted the casino offer after registering, you’d be stuck with the £30 in free bets and couldn’t claim the 100% up to £300 offer that currently exists. Feel free to check out our other promo codes for William Hill first before making your decision. Contact William Hill directly, where you can either initiate a live chat, send them an email or find their UK and international phone numbers. Please note they have different phone numbers for different departments, so ensure you pick the correct one to get through to the right team.